On this project we have implemented and rolled out out Virtual Hold. Virtual Hold Concierge is a virtual queuing technology that educates and empowers callers. When customers are faced with hold time, Concierge tells them their estimated wait time (via Queue Speak Settings), and allows them the choice to receive a callback in the same amount of time as if they had waited on hold. Virtual Hold Rendezvous provides scheduled callback (Appointment setting) capability. When the contact centre is closed, or when it is not convenient to receive a Virtual Queue call at the quoted time, Rendezvous allows customers to schedule a callback at a time that is convenient for them and the contact centre. Outbound dialling is initiated by the Virtual Hold Queue Manager component using Genesys T-server to make “TMakePredictiveCall” requests. 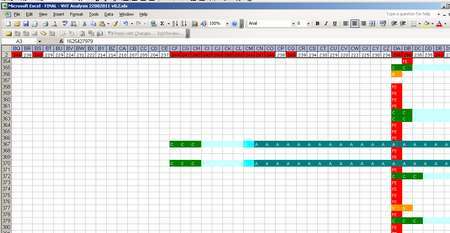 The pacing of dial request is controlled internally within the Virtual Hold application. Over the last few weeks we have noticed an increasing number of failed callback dial request due to “technical” errors. The suspicion is that this is caused by a lack of Avaya resources (trunks or call classifier ports). Fundamentally in VHT 6.7.2 there is no way of controlling the pacing of the dial requests other than to limit the number of callback requests offered and hence scheduled. Looking for concurrent callback dial attempts is like looking for a needle in a haystack so it was time to write yet another analysis tool to take the historical data from the VHT reporting database and then construct a timeline for each callback. Hopefully I can now get to the root cause of the problem quickly. Following on from R2 Performance Testing and subsequent ASR tuning I have been working on further speech recognition analysis in the last week. The Release 2 solution includes the rollout of Nuance Speech Recognition (ASR) for existing Customer identification. This is based on them saying their postcode and then the first line of the address. At this client we have a total of 9 Nuance Recognizer servers so pulling of the Nuance log files, analysing them to identify calls with 5 or more utterances, pulling off and listening to each of the individual utterance WAV file and then manually looking up addresses in our customer database was all becoming very time consuming and monotonous! Therefore I decided to extend the functionality of my custom Nuance Log Analyser tool to do all this at the click of a button! I also did a bit of playing with Microsoft Speech to Text using the dictation grammar to transcribe the audio utterances into text for me automatically! 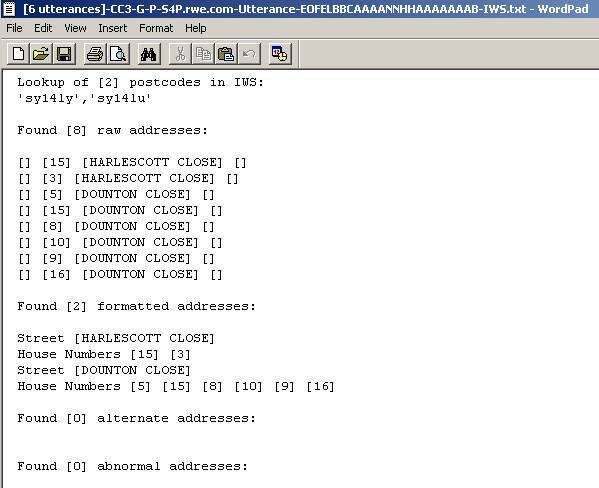 The output for each call to be analysed further (since the utterance count would indicate retries on both postcode and address line prompts) is 4 files: a WAV file containing the merged utterances separated with a “beep”, a text file containing a possible transcription of the audio, a text file containing the actual ASR interpretations and a text file containing possible addresses returned from the customer database. Reviewing each call now only takes 10 – 15 seconds!